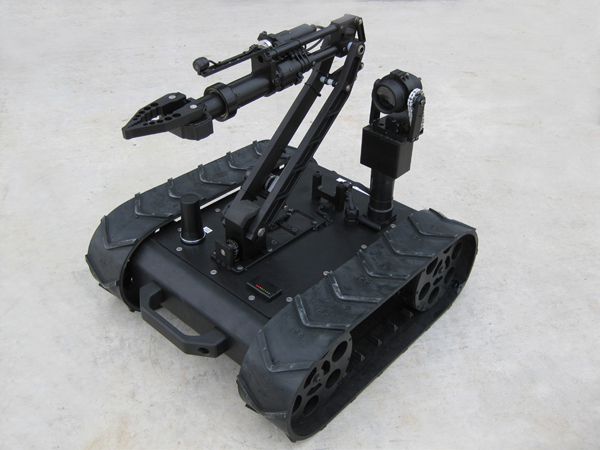 In a world in which an abandoned suitcase, a box, or even a pile of rubble can conceal an improvised explosive device (IED), bomb-disposal robots have become essential. 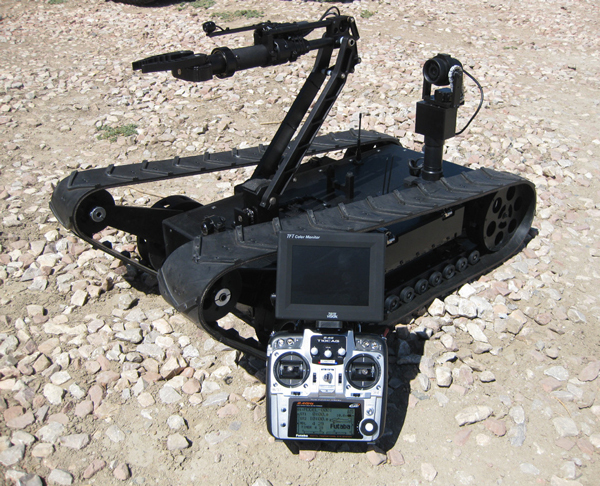 In a world in which an abandoned suitcase, a box, or even a pile of rubble can conceal an improvised explosive device (IED), bomb-disposal robots have become essential. Many units in the field bristle with cameras, feedback devices, and processors. Such sophisticated robots offer a significant amount of capability and autonomy but increasing complexity also drives up weight, size, and cost. Instead of organizations buying one device per platoon or police department, such systems have to be shared across several companies or counties. 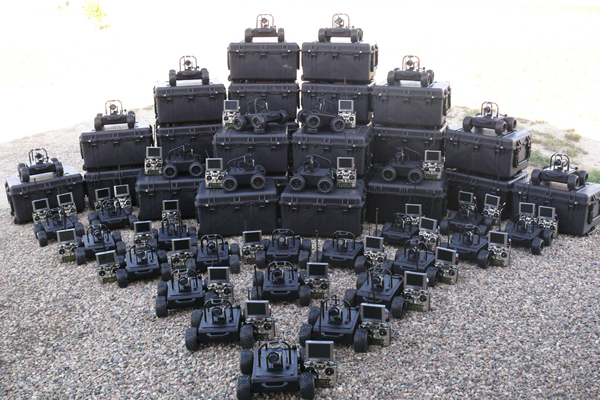 Enter the Mechanical Mobile Platforms (MMPs), a family of simplified, man-portable robots from the Machine Lab Inc. (Fort Collins, CO) that can perform a range of surveillance and bomb disposal tasks at a price point low enough for wide deployment. (see figure 1) For the cost of a high-end system, which can exceed several hundred thousand dollars, users can purchase nine or 10 MMPs. Powered by compact, economical, high-torque motors from the Faulhaber group’s value-added reseller MICROMO (Clearwater, FL), the Machine Lab’s robots are making a difference around the world. The mechanical mobility platform provides a significant degree of agility and manipulation in an economical, lightweight design. To control costs, the base unit does not incorporate feedback or processors but leverages direct operator control over a wireless link. The Machine Lab engineering team started out with one overarching principle: keep it simple. This required an immediate trade-off. Instead of a robot that can perform 95% of what is needed, an MMP might only handle 60% of the tasks. Then again, as all engineers know, a solution doesn’t need to be perfect, it just needs to be adequate to the application at hand. Rather than focusing on building a single product, they took the big picture approach and developed a modular design platform that can be applied to a wide range of implementations. 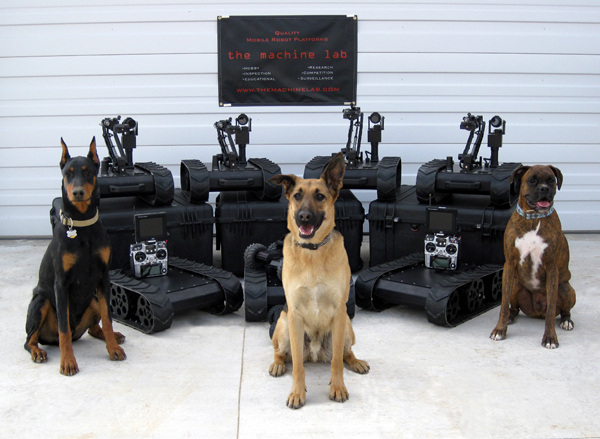 The basic line includes a quartet of direct-drive MMPs ranging from a four-wheel model that can carry a 4 lb. payload to a six-wheel model that can handle up to 30 lb. For loose terrain, the company also offers two track-driven versions: a four-wheeled version and a six-wheeled version. (see figure 2) Here, too, the focus on simplicity came into play. Instead of driving with all wheels, each of the track-driven MMPs sports two passive wheels, providing savings in cost and weight without compromising performance. The team avoided onboard processors and feedback devices, opting instead for direct user control via wirelessly linked joysticks or switches. The operator determines the path of the robot based on images transmitted by the unit’s wide-angle IR camera. The mobile platforms provide a 0° turning radius and linear speeds as high as 6.0 ft/s. They range in size from 5 lb. and 11.5 in. × 11.2 in. to 40 lb. and 29 in. 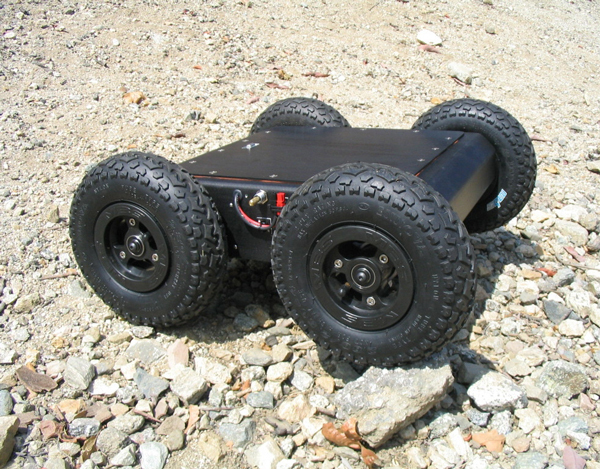 × 19 in., although custom versions can be larger, such as the 1500-lb unit built for clearing vegetation in mine fields (see figure 3). 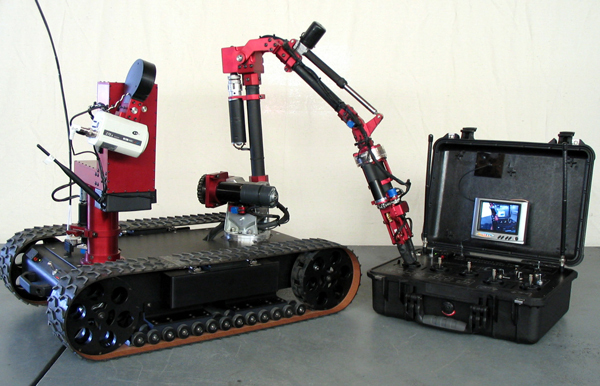 Perhaps most critical aspect of a bomb-disposal robot is the robot arm. Here, the engineering team faced a number of challenges, particularly in the gripper and wrist-rotation elements. To maximize the amount of payload a robot could handle while ensuring stability, they had to minimize the weight of the arm. That meant working with the lightest possible components. At the same time, those components had to power the arm so that it could grip a wide variety of materials and not only lift but rotate payloads as high as 40 lb. One obvious way to get the torque required was to gear down a high-speed motor, but that approach adds size and weight, as well as complexity and cost. In keeping with the company’s philosophy of simplicity, the Machine Lab team decided to skip additional gearing in the wrist rotator and look for a motor that provided enough muscle to do the job on its own. Efficiency was another important design constraint. Running out of power in a cell phone is merely annoying. Running out of power during the disposal of an IED can cost lives. At every step, the team focused on specifying components for the most efficient possible design. Here, too, MICROMO helped. “What the operators are doing requires as long a run time as possible, and a very simple solution to swapping out a dead battery for a freshly charged one.” says Bieber. “Getting a lot of torque from the motor for a low input current allows us to save on battery use.” With the high-efficiency design, the units can deliver as much as an hour and a half of constant operation on a single charge from a 25-V lithium ferrous phosphate battery pack that weighs just 1.5 lb. The most challenging aspect of the design was duty cycle, Bieber says. The motors for the wrist and gripper are specified to run 24 hours a day, but their actual duty cycle is closer to five or ten percent. During that time, however, they must routinely perform to their limits and sometimes beyond. “We had to find that balance of maxing out the motors’ capabilities for a very short period of time without damaging them,” says Bieber. “The types of tasks these robots have to do are all over the place, and it’s all dependent on the operator. If we say this can only lift and rotate 5 lb., they’re going to grab 20 lb.” To eliminate over driving or stalling the motors, the design includes adjustable slip clutches on both gripper and wrist rotator. Add to that a robust monitoring you’ve got a recipe for ruggedness. “We haven’t returned a single motor that I know of,” Bieber says. With the aid of its dedicated machine shop, MICROMO also applied an aluminum sleeve to some of the motors, retrofitting them to be compatible with a set of clamps that the Machine Lab had already manufactured. The modification allowed the company to leverage existing inventory while freeing up its staff to focus on more value-added activities. So far, their attention to detail has paid off. “We’ve got over 200 robots out in Afghanistan and surrounding countries, and probably another 50 to 80 out in law enforcement here in the US,” says Bieber. The company also recently secured another U.S. Navy contract for 250 more robots. And when it comes to disposing of IEDs, exceptional is exactly what you need.